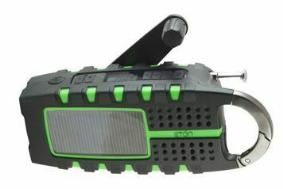 Eton's Scorpion is a solar-powered FM radio, flashlight, phone charger... | What Hi-Fi? Not content with FM, MW and SW tuners, you'll also find an LED flashlight, mobile phone charger and even a bottle opener included in the £50 package. With a line input you can connect another portable device to the Scorpion as well, while the eye-catching design is splash-proof and built to last. Last but not least, it has a rechargeable battery can be charged with good old-fashioned elbow grease using the 'hand crank dynamo'. If that's a bit like hard work, you can use the built-in solar panel or the mains power connection. Due out in May, the Eton Scorpion will set you back £50.